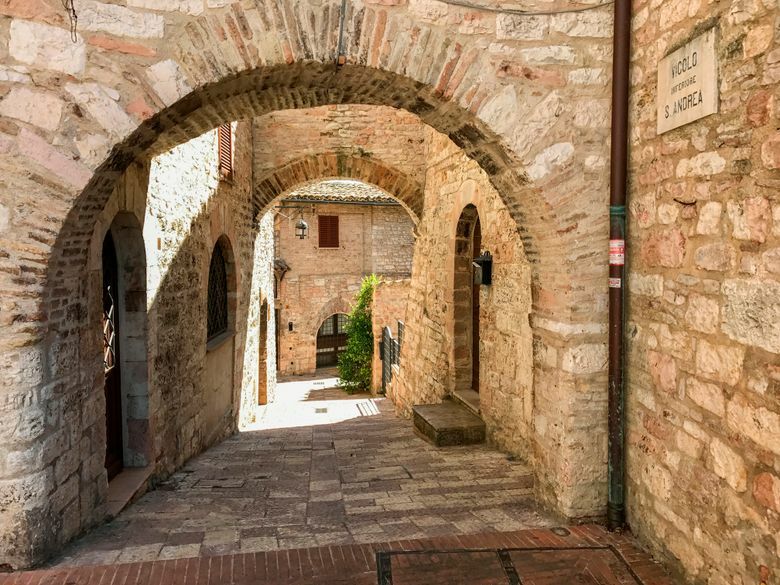 ASSISI, Italy — A hilly patchwork of yellow and green Umbrian fields unfolded on both sides of the road as I zipped around hairpin turns in my little red Fiat, feeling every bit the race-car driver. Of course, this being Italy, what I thought was death-defying speed wasn’t fast enough for drivers coming up behind me. They barely hesitated, passing me on blind curves on the otherwise nearly deserted road. It was a bit unnerving, but over a week, hopping between Umbria’s hill towns, I relaxed my grip on the steering wheel and found that getting there was half the fun. On my way to the village of Todi that first night, I kept pulling over for the views. Between serpentine roads and stops to take pictures, it took me nearly an hour to travel 10 miles to the village from the stone farmhouse where I stayed. Umbria is a landlocked agricultural region known as the green heart of Italy. A drought earlier this year rendered many hillsides tan instead of green — drooping sunflowers with browning leaves were a common sight — but I still encountered one of the most beautiful landscapes I’d ever seen. Once I arrived in Todi, I parked and took a free funicular, like a diagonal elevator, to the top of a mini plateau. 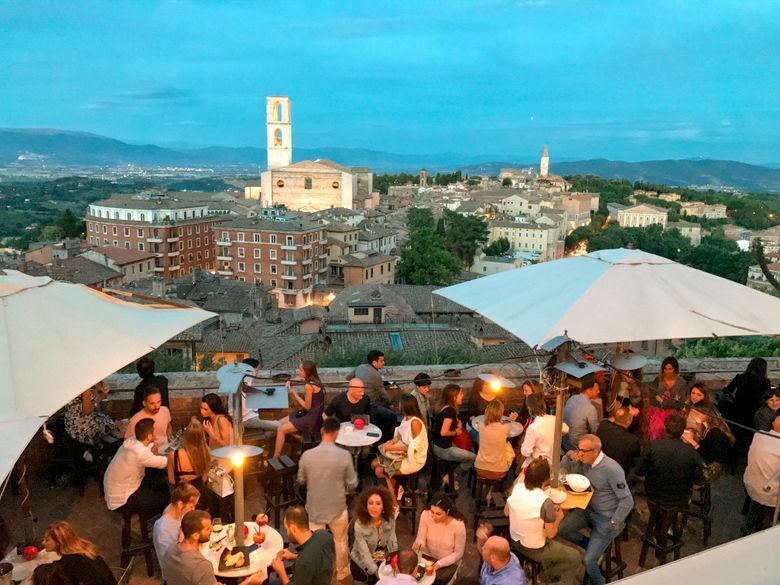 The smell of wood smoke lured me from the Piazza del Popolo to the literal edge of town, the cliff top Ristorante Umbria, for a bite and a view of the sun dropping behind distant mountains. A cluster of travertine-block buildings just off the piazza looked in the twilight like a medieval theme park, but the town’s winding cobblestone alleys were alive with the real sounds of children’s singsong chatter and dinner dishes clattering through a window. A news show blaring from an unseen TV brought me back to modern times. These signs of real life in Umbria’s ancient towns were ever present but never failed to surprise me. In Foligno, young couples with baby strollers were well-represented in a crowd listening to a free concert in the main piazza. In Gualdo Cattaneo, the town’s millennials take over a cylindrical fortress on weekend nights to run a co-op bar with 360-degree views of the valley. Only in Perugia were locals harder to find, but that was due to a jazz festival drawing thousands of visitors. Bartenders, tour guides and hotel workers said visitors have dipped since earthquakes shook central Italy last year. But even before that, Umbria was less busy than some other regions. The area is sometimes compared to Tuscany, with food and wine as abundant as the vistas, but without the crowds. That’s partly because it’s not served by high-speed trains. 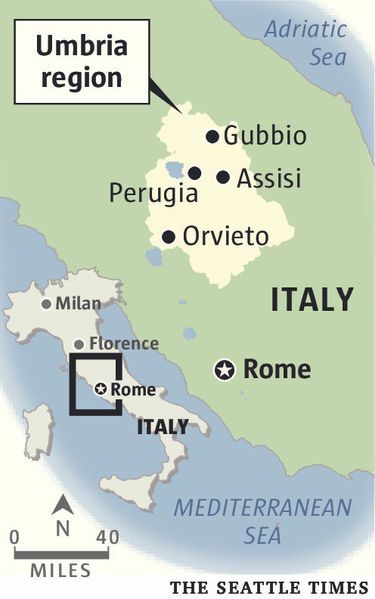 Instead, visitors can take regional trains from Florence. I flew to Rome and drove two hours to get there. By the end of my week there, I had learned how to handle the Fiat, like when to slam the four-cylinder engine into first gear to shoot up those hills rather than crawl. I used the move to get around a brave cyclist on my approach to Assisi, whose arid stone buildings were camouflaged from a distance by beige hillsides. Like a desert lizard, up close the town’s brick facades and streets were speckled with a range of sand-to-brown shades, flecked with pink limestone. Assisi has been a pilgrimage site since St. Francis went into the fields to preach his message of love. He renounced his wealth there 800 years ago in the main Piazza del Commune. I watched the ragazzi — local kids — walk through the piazza from the steps of a Roman temple to a statue of the goddess Minerva. The temple’s Corinthian columns have been preserved, but the interior is gilded Baroque, thanks to a 17th-century renovation that turned the temple into a small church. Off to the side, African nuns in powder-blue habits took selfies in front of a statue of St. Clare, an acolyte of St. Francis. A pink and tan basilica honors Francis on a promontory overlooking the valley. Ecclesiastical music floated from shops along Via San Francesco, which leads pilgrims to the basilica. Monks in black robes and rope belts wandered the grounds of an on-site monastery. Inside the cavernous church, frescoes told the story of how Francis rejuvenated the church by focusing on common folk. The message resonated and left me with a sense of peace. I tried holding on to that feeling during the long drive back to the Rome airport, but I couldn’t help getting a thrill out of one last windy ride.